The Intergovernmental Oceanographic Commission (IOC) of UNESCO is leading the thematic assessment of the Open Ocean. planet Earth (ocean areas under national jurisdiction cover a further 20 per cent), under the ultimate governance of the UN General Assembly. Governance of the open ocean is mediated mainly through global international treaties based on particular themes (climate change, fisheries, pollution, biodiversity), as well as some regional conventions. Global impacts on the ocean such as pollution and fishing come from human drivers on land and at sea. And global impacts on human society can be driven by the global open ocean through its role in the climate system. The oceans have a role in mediating patterns of rainfall and drought (an important input for the other TWAP water systems); global climate change is leading to sea-level rise and ocean acidification, with growing impacts on ocean ecosystems and on tourism and fisheries. Communicating these impacts remains a challenge. There are many challenges to assessing how human wellbeing and stakeholder behaviour are affected by and linked to changes in the open ocean. A primary challenge relates to the limited scientific data on the state of the ocean: its physical state, chemical state, the state of ocean ecosystems and living marine resources. Monitoring systems of the state of the physics of the upper ocean, and the ocean carbon system related to climate, are not fully implemented and have gaps in their adequacy. Monitoring of the state of ocean ecosystems in particular is lacking. However a lack of sufficient monitoring and understanding should not rule out an assessment of the high uncertainty, long timescale, and yet potentially very high impact environmental problems associated with the global ocean. Indicators are key to communicating problems and tracking progress. The assessment provides a scoping analysis for looming future problems through development of indicators and an expert assessment of the latest scientific literature. It acts as an analogue to the WMO-UNEP Intergovernmental Panel on Climate Change (IPCC) assessment of the human relationship to climate, and complements the UN Regular Process and the World Ocean Assessment. Quantifying uncertainty will always be a key part of the assessment of the ocean to support its management. The open ocean assessment has focused on where data are available, making extrapolations, assumptions and projections based on best scientific knowledge to generalize where data are lacking. It has also addressed key gaps for research and observations to point to a future path to reducing uncertainties about our knowledge. The cost of management action to limit human impact on the open ocean, and of the open ocean on human lives, is often difficult to establish when the threats and benefits are not clearly monetized. Of the many ecosystem services provided by the open ocean (regulatory services, provision of food, energy, recreational and cultural services), the only one that is traded on markets is fish. An assessment of changes in the valuation of natural capital with changes in the ocean could help inform debate. The global governance arrangements for the open ocean are complex and therefore deemed a priority focus to better understand them, through this Assessment. In deciding where future interventions can help to mediate this relationship between human and natural systems and increase human wellbeing, the Global Environment Facility (GEF) and other stakeholders will need to target these global conventions, and work to ensure that links to lower-level policy cycles, including regional and local scales, are fully understood. The TWAP Open Ocean Assessment has addressed these challenges through a globally-scoped analysis that directly considered six broad themes: governance, climate, ocean ecosystems, fisheries, pollution, and an integrated assessment of these impacts on marine ecosystems. Rather than carving the open ocean into units based on natural system criteria, which can vary depending on the scientific discipline consulted, and whether the surface, mid, or deep ocean is being considered, the analysis took the cue from the human system side and the global governance arrangements already in place to focus on a global thematic assessment. The assessment aimed to clearly link human vulnerabilities on land to the open ocean, and ecosystem vulnerabilities in the ocean to human threats. It addressed the political need for clear, high-level messages about the issues raised, and points towards interventions in governance that can help mediate the relationship between humans and the ocean, improving human wellbeing. A Conceptual Framework was used to organize the necessary simplifications and assumptions rising from the scientific work to achieve this goal. The Conceptual Framework links human and natural systems, puts human wellbeing at the centre of concerns, but allows a focus on where data are available, in particular on indicators of human-related stress on ocean systems. For this assessment, the framework allowed clarity on where simplifications and assumptions were being made in the causal chain, and emphasized the vulnerability of human and natural systems. It put a broad definition of governance at the centre of the human system side to help guide future interventions. The results provide a baseline of information on the state of the open ocean ecosystems, alongside projections of potential changes to 2050, and in some cases 2090. They also complement the Summary of the First Global Integrated Marine Assessment (2015) as part of the UN Regular Process for Global Reporting and Assessment of the State of the Marine Environment, including Socio-Economic Aspects (Regular Process), otherwise known as the Summary for the World Ocean Assessment (2015). It is clear, from the results of the TWAP Open Ocean Assessment and considering the Summary for the World Ocean Assessment (2015), that urgent attention is required to sustainably manage the open ocean ecosystems and services now and into the future. Understanding the impact of climate-ocean-human interconnections will help inform and improve decisions for sustainable management. To do this, however, ongoing and improved monitoring of essential ocean variables, including physical, chemical and biological, is necessary. The UN’s Global Ocean Observing and Climate Systems (GOOS and GCOS) can help drive this forward. Monitoring and management/policy interventions can be improved, guided by these results and the recommendations outlined in the accompanying TWAP Open Ocean Summary for Policy Makers – Status and Trends (2015). In particular, issues linked to complex governance arrangements (and with many gaps), climate change impacts such as ocean acidification, de-oxygenation, and ocean warming, are threatening the health of open ocean ecosystems and related services and human wellbeing. Urgent reduction in greenhouse gas emissions, together with improved regulations for reducing pollution sources and over-exploitation of fish stocks, could significantly improve the future health and sustainability of the open ocean ecosystems, services and human wellbeing. The TWAP Open Ocean Assessment provides a holistic overview of the state of the open ocean ecosystems and their connections with wellbeing. This can be used to guide a system of monitoring goals that could be set out within the Sustainable Development Goal framework, and should also be used to support future rounds of the World Ocean Assessment and subsequent targeted transboundary assessments for the ocean. Indeed, an ongoing and robust scientific support enterprise is essential to provide confidence to policy and decision makers that resources are being appropriately allocated for improved sustainable management and use of the ocean and its ecosystem services. A strong global partnership of world-class experts, institutions and data providers has contributed to the Assessment. The European Commission-funded GEOWOW (GEOSS Inter-operability for Weather, Ocean and Water) Project is a Core Partner supporting this Assessment with the technological tools and data system for the development of indicators, and ultimately, the storage, access and local reuse and refinement of global ocean indicators. 3. Improved global governance of the open ocean and areas beyond national jurisdiction, linked to regional governance networks, is urgently needed to solve the majority of local risk posed by ocean ecosystems degradation. 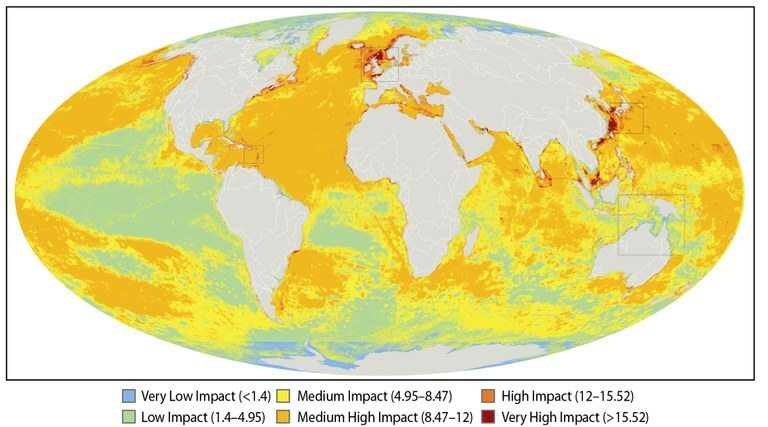 Map: Present-day Cumulative Human Impact on ocean ecosystems (Halpern et al., Science, 2008).